Learn how to wear saree in quickly and easily. Saree is a long fabric of 5-6 meters worn in so many various ways to suit women from her age to her figure as per the occasion of wearing a saree. It’s a very versatile apparel and has also been worn from generations in traditional ways as well as now in modern ways. Designer’s have also brought new drapes to bring a total new look of saree. Learn how to wear saree for wedding, how to wear saree for party look and saree draping in different style. 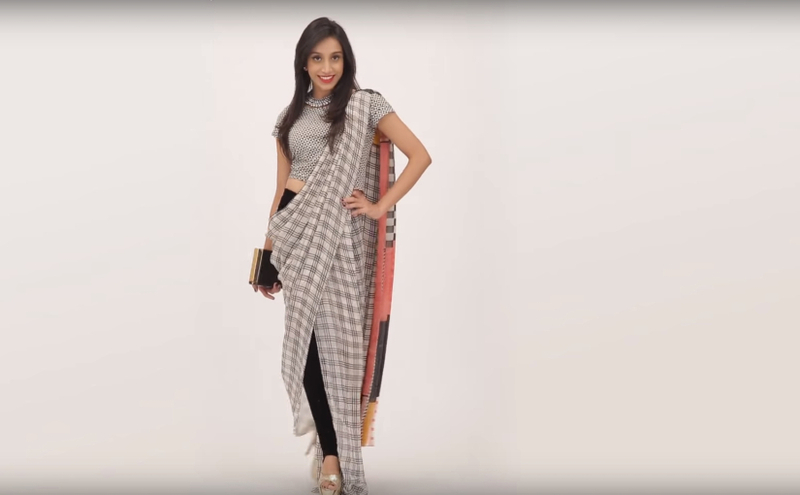 Here are some of the best saree draping styles step by step. This is a way where you are accentuating your hips section or showing attention towards your petite figure, in other words wearing a saree perfectly to look slim. 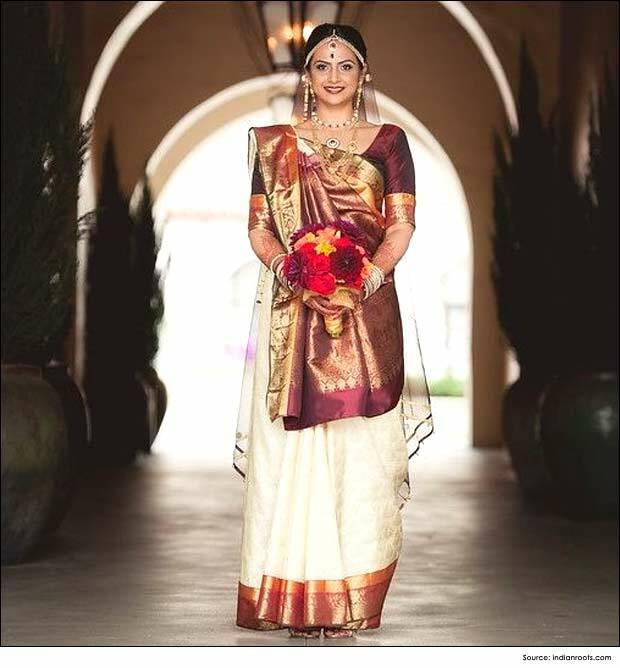 Start by holding the inner edge and corner of the saree and drape it around you from the right side of your waist and wrap it around from the front to the back and stop at the right side. Next leave some fabric which is the fabric till your upper edge border and tuck this roughly in your center waist line. Take the remaining saree around you from the left side to the back and bring it to the front so that you can make pallu pleats on the width wise section. Take hold of the saree pallu and make pleats of 3-4 inches wide. Secure them with a safety pin so they don’t move and place the pleats on your left shoulder so that they hang vertical at about 1.25 m or more depending on the requirement. Secure pleats at the shoulder on the blouse with a safety pin. Now remove the edge we tucked in roughly at the center waist and pull it towards the left side neatly and tightly and tuck it at the waist. This will create the tight figure and slim look. Lift the loose loop of saree which are to be made as your lower drape skirt pleats. Make 3-4 inches of the pleats and tuck them facing the right neatly in your center waist. Wear your traditional saree drape styles for marriage as per your tradition or culture from Bangali saree or Gujarati saree styles. Take the saree inner edge and start draping by tucking in at the right waist and take it around once till your right waist. Now drape ahead till your left waist and then make a reverse pleat tuck, that means fold the saree reverse and tuck in your waist till the right side. You can make another pleat also if desired as per your height and figure shape. Now take the width section and make pallu pleats of about 5-6 inches and secure them with safety pin at intervals so your pleats don’t mess up. You will need longer pleats. Hang the pleats directly from the front over your left shoulder; let them hang till you reach a same level cowl in front or till your reverse pleat forms a triangle shape over it. Pin this at the shoulder with your blouse and secure well. Now adjust the drape of the inner border from the pleat and draw this across your bodice, under the arm and to the back waist and tuck in or secure with safety pin. Gujarati saree draping normally worn by ladies of all ages at weddings and they normally wear the silk sarees, bandhani silk sarees, and other kinds which has an elaborated pallu. 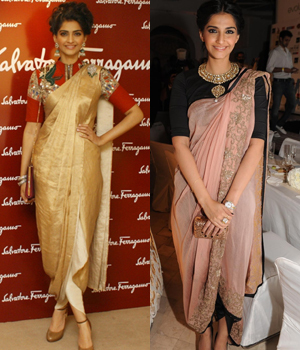 Start with the same basic on the saree by starting the drape and wrapping it once till reaching the right waist tuck. Now take hold of the saree width which is your pallu section and make pallu pleats depending on the saree style. You can make broad pleats like 5-6 inches or smaller 3-4 inches as needed. Secure the pleats with a safety pin. Then drape the pleats by taking them around you from the left side to the back and take them on the right shoulder from the back. The pleats will hand in front of your torso from the right shoulder. Adjust the length of the pleats from 1 meter or shorter depending on your figure. Pin the pleats on the shoulder with your blouse. Open the pin you used to secure the pleats earlier. Hold the edge of the saree from the pleats behind leaving some fabric behind creating a cowl and tuck the top edge on your left side waist. Now the saree has the loop in front which are the pleats and make 4-5 inches pleats and tuck there in your center waist but this time facing the right side. Open the shoulder pleats by pull across the inner section border edge and cover your torso totally by the drape and tuck or pin it at the back waist or blouse. That’s the basic style of Gujarati Saree draping there are more variations also like the Rajrani drape which also requires all the same steps as the Gujarati saree, except for the last step which has the variation. Pull out the inner border edge and cover your bodice with this formed cowl, pin the corner of the saree at you left shoulder with a pin. This will create an illusion of draped dupatta over your saree. Start by dividing the saree into two parts which is where the left side is shorter than the right side which is your pallu side. Drape this around your back waist, bring then in front at the center and tie a knot of this section together. Then take hold of your left section edge and pull it behind from between your legs. Make narrow pleats of 3 inches where the border pleats is on top and facing the right side. Tuck these in your back waist at center. Now left the saree section of the right from the waist line and make 4-5 pleats of 3 inches and tuck them in your center waist so that they are facing the left side. Now take the edge which comes beneath the pleats tucked in the front waist and drape this tightly around your waist taking it behind and back to the front. Make pallu pleats at the width wise saree, pleats of 6 inches or wider they should be broad. And drape them around your bodice on the left shoulder and secure with a safety pin. A south Indian saree style is normally a Silk sare drape which is widely worn for weddings. South Indian bridal saree draping is the one kind which many would love to try with a silk saree for sure. This also requires the same steps as any basic saree draping style. Repeat all the steps of your draping till you come to the pallu pleats. Make big pleats of 5-6 inches pleats for the shoulder pleats. Use pin to secure these and then place them at your left shoulder. Now pull out the inner edge border from the pleat and drape it across you bodice neatly taking it behind from under your right arm and then tightly drape in around the left waist and back to the front, tuck it tightly in your centre waist. Then make pleats of the remaining saree loop in front. Secure them with a safety pin before you tuck them in at the centre waist neatly. Now use your figure to flat the hanging shoulder pleats and crease them in the folds of the pleats. Adjust the pleats on the front bodice neatly so the fall in a step by step format and crease thes up neatly with your figures. Use a waist belt or a kammar bandh and wear it over your saree on the waist. These were some of the saree draping styles for traditional sarees and also modern styles saree draping for parties or weddings. The latest saree trends have revived to new modern and western saree. Half saree style in half dhoti, indo western saree and more style are a part of the latest saree styles. Put on a complimenting blouse or a crop top to match your saree and also a leggings, jeans or jeggings which may suit your needs. Choose the saree which has a flowy fabric like georgette or satin. Now start draping by holding the inner edge of the saree and make big pleats of 5 inches. 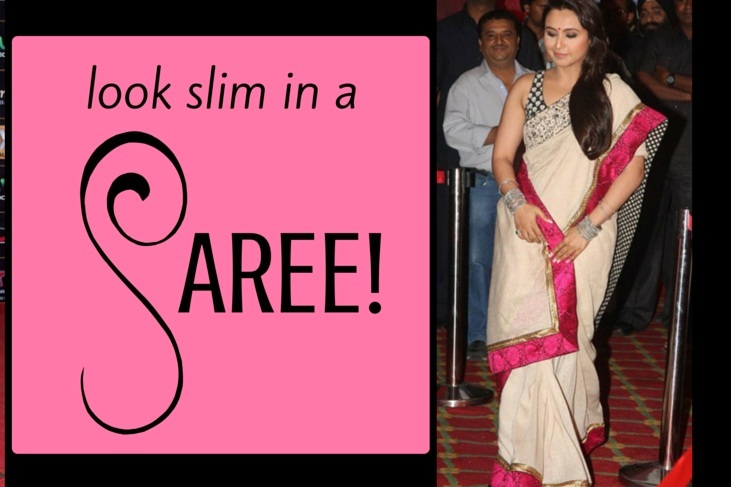 Make the pleats till you reach half way of the saree or a bit more as per your height and figure shape. Now take these inside your waistline at the center so that the remaining fabric comes out on the left side of the waist. Tuck in the remaining edge around your waist and stop at the right side wait. Pick the width wise section and pleat these for the shoulder pleats. They can be as narrow as you like. Secure with safety pin after you place them on you left shoulder. Adjust your drape properly so that the pleats don’t cover your bodice totally and a cowl is formed on your right hip. You would require a saree is which shorter than the usual length around 4-4.5m as per your figure shape. Dress your leggings and crop top or blouse for the look. Start by making pleats on the width wise section on the inner side of the saree length, use a pin to secure pleats. Tuck these on your center waist which shows the border on top and faced towards the right side. Now pull out the loose edge from the pleats and drape in around your waist till the left waist line. Bring the saree around from the back to the front and make pallu pleats. Place the pleats on your left shoulder and secure with pin. The border will face outwards. Now adjust the pleats on the bodice by tucking in the inner border edge towards the back side waist. Use a pin to secure it here. Now there is a big loop behind which are your lower drape pleats. Hold the center of the saree and fold the saree to make box pleats, pin to secure pleats and tuck these in your center back waist. IF you Like any saree draping or if you have confusion then please share your thoughts in comments, So I can improve it and publish the right one.